Diagnosis: Illinois bundleflower is a perennial plant usually 0.3 - 1.0 meters tall. Stems can be smooth or slightly hairy. The leaves occur in an alternate, twice-pinnately compound pattern. Pinnae are 2-4 cm long with 6-15 pairs. Leaflets are 3-5 mm long with 20-30 pairs. The leaflets are also touch-sensitive and will fold together when handled. Inflorescences on the bundleflower are 2-8 cm long and appear as a dense, globular head originating from the axils of the upper leaves. 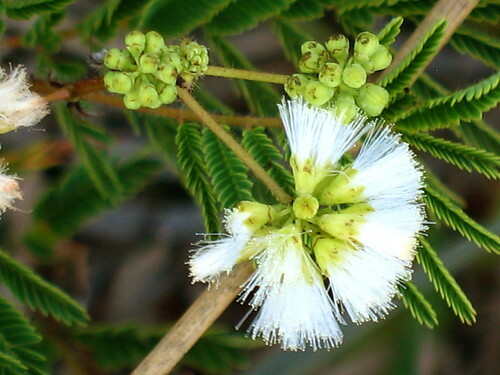 Small, whitish flowers are produced July through August. Fruit is developed as a curved pod occurring in dense clusters. The pods are 1-2.5 cm long and contain 2-6 seeds per pod. Flowering period: May through July. Distribution: Illinois bundleflower is distributed from North Dakota and Minnesota, to New Mexico and Colorado, and from Texas to Florida. It is distributed broadly in Kansas. Habitat: Occurs in prairies and open sandy sites, often near bodies of water. Haddock, M.J. 2005. Wildflowers and Grasses of Kansas. University Press of Kansas, Lawrence, KS. Illinois bundleflower. Photo by Amy Coffman, July 2011.